I've been wanting to show you these nails for ages! They're my current pride and joy; I'm very happy with how they turned out... well, the left hand at least! Not so much the right hand - you'll see that further down. Who knows Spot? I'm sure most people do, at least those who grew up in the 80's onwards or had children around that time. For those that don't know him, Spot is the main character a children's book series by author Eric Hill (who unfortunately passed away recently). It was later made into a TV series which I watched heaps of as a kid! You can check out Spot's Wikipedia page here. Laura Wales and I collaborated for our latest videos, and the theme was "your favourite childhood book." I was, am, and always will be a proud bookworm, so it was pretty impossible to choose just one. I decided to choose one that I really loved, and was a bit easier to paint on my nails than the "Five Find-Outers" by Enid Blyton... and so Spot ended up on my fingertips! Here's the tutorial for the little guy. He's so cute! If you try this, make sure you use a really thin brush - I cannot stress how big of a difference this makes! I have a video about cutting down your brushes here. Please subscribe ☺. Laura was the lovely girl who I collaborated with! 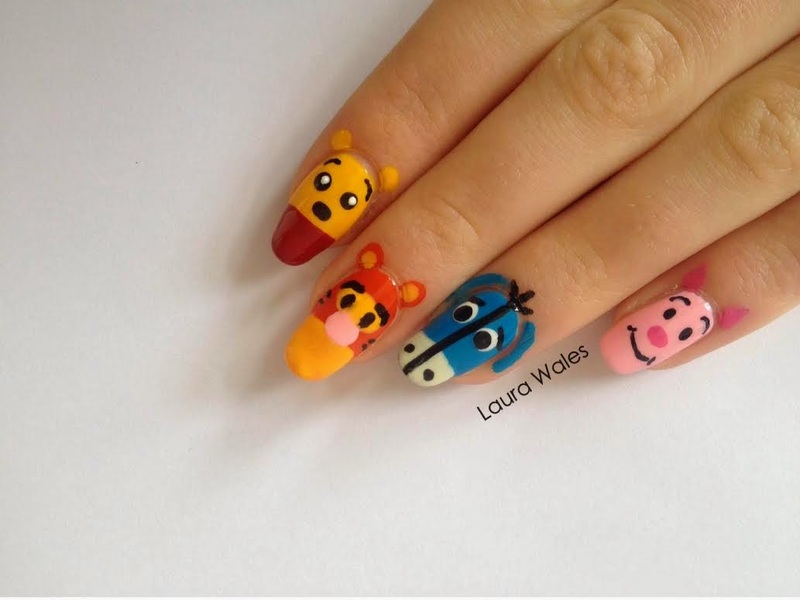 She did this super cute Winnie The Pooh design - I love Eeyore! You can subscribe to Laura's channel below, and I hope you like her tutorial! Thanks for collaborating with me, Laura! Here are some more photos of this nail design ☺. The day I did this nail art, I had Spot's theme song in my head for HOURS. If there ever was a pup to cheer you up, it's Spot, Spot Spot!" It got a little annoying. The right hand; okay, this is why you need thin brushes for Spot. He just looks weird! Made me appreciate how he looks on the other hand, at least. The writing turned out better on this hand, which I found kind of unexpected! And irritating, since you'll see in the video that I messed up the "S" on the left and had to fix it up on camera. The nails with the inspiration! And one last shot. He's such a cutie! Hope you like these nails! There was another book I really loved as a kid, it was about a mouse and I read it thousands of times... yet I can't remember the name of it for the life of me! Did you have a favourite book as a child? Let me know in the comments! Jessie, these are very cartoon-y and silly. I think your dominant hand turned out great -- the differences are minimal (at least to an untrained eye). Thanks for the inspiration!